I didn’t have the most successful day on DraftKings yesterday, but still put up 112.85 points which didn’t win me anything. 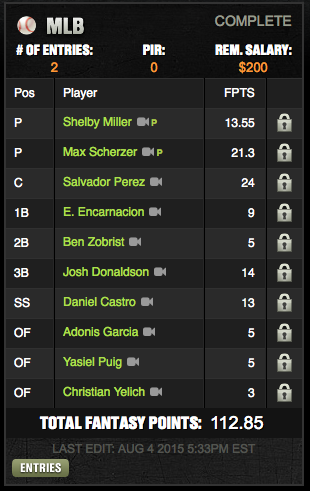 My biggest mistake was taking expensive pitchers as it really cost my lineup in the long run. 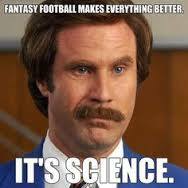 Today I’m just going to do a quick summary of my lineup and not do a position-by-position breakdown. The two pitchers I choose today was Madison Bumgarner and Luis Severino. The reason for choosing Bumgarner is plain and simple, the Atlanta Braves offense has been awful lately especially against good pitching. The Red Sox, like the Braves, have been awful lately, but most of that is a result of poor pitching. I think Severino is the perfect value pick today and is a good player to take a risk on. As for my position players, I went after players on teams that are hot right now. Anthony Rizzo and Kyle Schwarber of the Chicago Cubs are playing great baseball and have been hitting the ball very well add that them facing Jeff Locke, who’s struggled against the Cubs this season. The Royals are facing rookie pitcher Matt Boyd and that bodes well for Ben Zobrist and Lorenzo Cain, who have both been on a tear lately. Troy Tulowitzki is playing in the Rogers Centre and facing Tyler Duffey, who’s making his major league debut. I would recommend doing one lineup stacked with Toronto players. 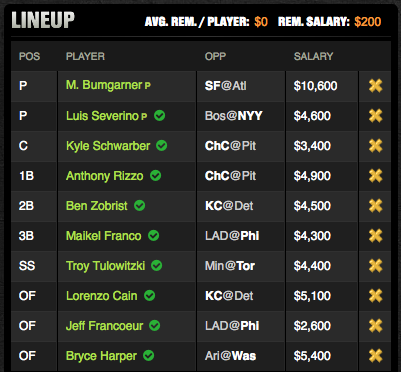 Maikel Franco, Bryce Harper and Jeff Francoeur round out my lineup for today.